can we feed nine billion people after fossil fuels? "Two views are vying for the allegiance of humankind. One is the status quo -- more industrialized growth, leading to a computerized world of 12 billion people surviving as a global ant heap. The other is a transformed civilization based on wisdom, restraint and caring." The cheap oil age created an artificial bubble of plentitude for a period not much longer than a human lifetime, a hundred years. … So, I hazard to assert that as oil ceases to be cheap and the world reserves are toward depletion, we will indeed suddenly be left with an enormous surplus population … that the ecology of the earth will not support. No political program of birth control will avail. The people are already here. 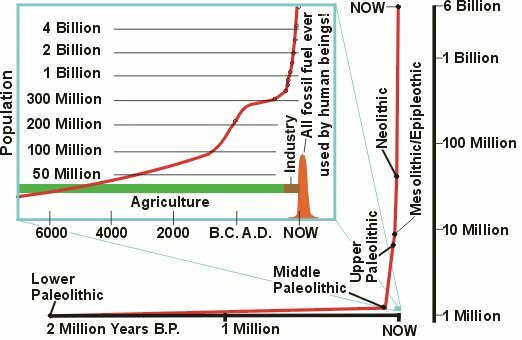 The journey back to non-oil population homeostasis will not be pretty. We will discover the hard way that population hypergrowth was simply a side effect of the oil age. It was a condition, not a problem with a solution. That is what happened and we are stuck with it. Peak Oil, depletion of other resources, climate change and overpopulation are tests -- will we evolve or perish? "[In response to this question by Bill Moyers: What do you see happening to the idea of dignity to human species if this population growth continues at its present rate?] "It's going to destroy it all. I use what I call my bathroom metaphor. If two people live in an apartment, and there are two bathrooms, then both have what I call freedom of the bathroom, go to the bathroom any time you want, and stay as long as you want to for whatever you need. And this to my way is ideal. And everyone believes in the freedom of the bathroom. It should be right there in the Constitution. But if you have 20 people in the apartment and two bathrooms, no matter how much every person believes in freedom of the bathroom, there is no such thing. You have to set up, you have to set up times for each person, you have to bang at the door, aren't you through yet, and so on. And in the same way, democracy cannot survive overpopulation. Human dignity cannot survive it. Convenience and decency cannot survive it. As you put more and more people onto the world, the value of life not only declines, but it disappears. It doesn't matter if someone dies." On the Highway of the Damned, Are We There Yet, Pa? Without doubt, our civilization is about to end. We have a decade or two at most. Don’t waste any tears on this false economy and false culture. It was based upon a one-time glut of cheap energy and psychotic exploitation of our neighbors and it did more harm to us than good, socially and spiritually speaking. We can only look to the future. This particular correction will take everything we have and more just to survive. It is a good time to believe in miracles. Dr. Youngquist, P.O. Box 5501, Eugene, OR 97405. These definitions are from Overshoot: The Ecological Basis of Revolutionary Change by William J. Catton, Jr.. Do not read this book if your dream in life is to sit on as much money as Billy Boy Gates #3. Carrying Capacity Deficit, Overshoot: the condition wherein the permanent ability of a given habitat to support a given form of life is less than the quantity of that form already in existence. [The deer multiply beyond the number where the forage can grow back. In their hunger they devour it down to the roots where it grows back even more slowly, and almost all the deer then die off. This happened at St. Matthew Island. It also happened with people at Easter Island.